The Veterans Memorial – or Legion Hall as oldtimers call it – is one of the valley’s most important historical buildings. It has served veterans and the entire community for over 80 years. “Contra Costa county is notable among the counties of the State in its memorials to World War veterans. When the doughboys started over seas they were promised that when they returned they could have ‘anything they wanted’. Making good this promise, the board of supervisors has built a veterans’ memorial hall in each town in the county where there is an American Legion Post. These are now being finished and dedicated. Walnut Creek dedicated its hall last Sunday. Danville hopes to open its hall on Washington’s Birthday. “The buildings were paid for by a small direct tax, all of which has already been raised. On the threshold of each one is a brass plate reading ‘Dedicated to those who served’. While the halls are nominally in the custody of the American Legion, they are open to all veterans’ organizations. The Legion men have gone further and offered their use free to any and all patriotic, civic and welfare associations, such as the Boy Scouts, Red Cross, farm bureau, chamber of commerce and improvement clubs. They will be, in a manner, community halls. The contract was given to Dinnie Construction in late 1924 for $18,000 and was designed by architect James T. Narbett in a classical style. The building was frame and stucco construction, two stories, 60 X 21 feet, with a ground floor auditorium 40 X 70 feet, exclusive of stage. E. A. Root of Danville was named as inspector of the Memorial hall construction work at a salary of $8 per day. After temporary officers were elected at a January meeting in 1925, resolutions were adopted restricting the use of the new Veterans Memorial to patriotic, civic and improvement associations. The Danville Community Hall referred to the Social and Fraternal Hall on Front Street which had been built in 1913 by the IOOF and Danville Grange No. 85 (today’s Village Theatre). In the coming years, these two locations hosted gatherings of any size in the village, including meetings, dances, plays and graduation recitals. 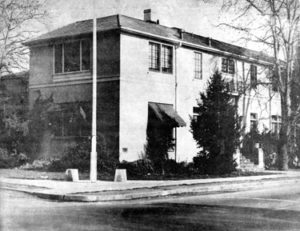 When the Veterans Hall was dedicated on April 2, 1925, the Danville Improvement Club donated a piano and the China Club provided a large American flag. Both the library and the local chamber of commerce soon had offices in the new building. From the start the veterans created a place which welcomed the whole community. Sources: S. F. Chronicle, Courier and Journal (Jan. 23, 1925), News Notes of California Libraries (April 1926), Valley Pioneer (June 7, 1961), Museum of the San Ramon Valley archives.